Little, Brown Books for Young Readers, 9780316506625, 32pp. 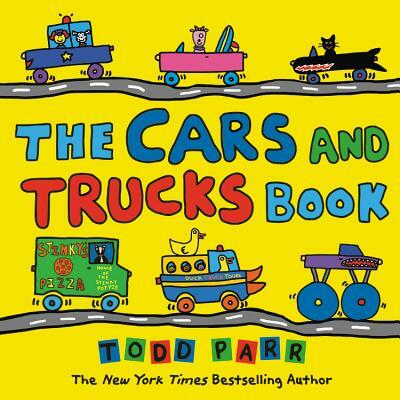 From bestselling and beloved author Todd Parr, a new book about all of the different ways that cars and trucks help people and have fun. Some trucks help on the farm. Some trucks help in the city. Some cars like to drive in the snow. And some cars like to drive to the beach. All cars and trucks LOVE to be on the ROAD! Todd Parr brings his trademark bright colors and bold lines to his new book about cars, trucks, and the occasional bus. In a fun collection of silly images, Todd explores all of the ways vehicles have an impact on our daily lives, while weaving in messages about positivity, the environment, and safety. Readers will laugh along with the whole four-wheeled gang! Todd Parr has inspired and empowered children around the world with his bold images and positive messages. He is the bestselling author of more than forty books, including Be Who You Are, The Goodbye Book, The Family Book, The I Love You Book, and It's Okay to be Different. He lives in Berkeley, California.